Beware the Roadbuilders: Literature as Resistance was born out of blogging as an act of social justice. Over a period of about two years, many posts built the case against market-based education reform and for a critical re-imagining of public education. This book presents a coordinated series of essays based on that work, using a wide range of written and visual texts to call for the universal public education we have failed to achieve. 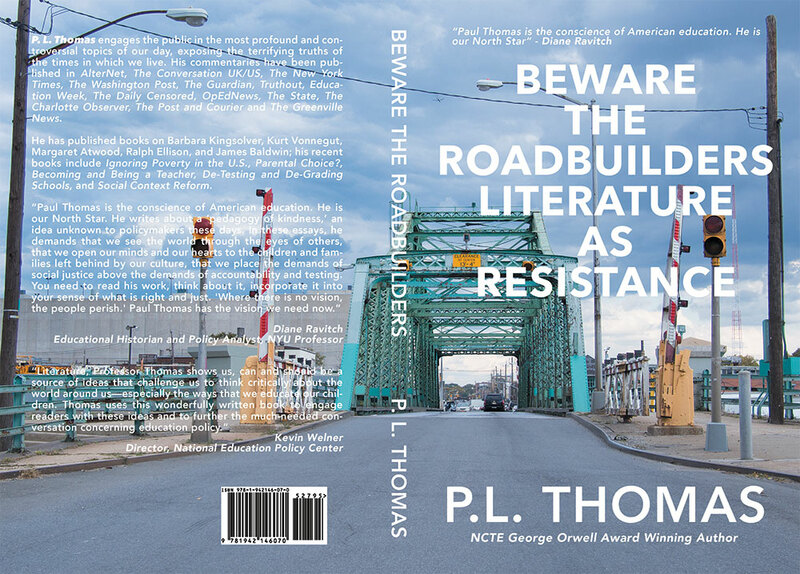 The central image and warning of the book -"beware the roadbuilders"- is drawn from Alice Walker's The Color Purple. The book presents a compelling argument that billionaires, politicians, and self-professed education reformers are doing more harm than good-despite their public messages. The public and our students are being crushed beneath their reforms. In the wake of Ferguson and the growing list of sacrificed young black men- Trayvon Martin, Jordan Davis, Tamir Rice, Eric Garner- the essays in this book gain an even wider resonance, seeking to examine both the larger world of inequity as well as the continued failure of educational inequity. While each chapter stands as a separate reading, the book as a whole produces a cohesive theme and argument about the power of critical literacy to read and re-read the world, and to write and re-rewrite the world (Paulo Freire). Supporting that larger message are several key ideas and questions: What are the confrontational texts we should be inviting students to read, that anyone should read? Instead of reducing texts to the narrow expectations of New Criticism or "close reading," how do we expand those texts into how they inform living in a free society and engaging in activism? How do traditional assumptions about what texts matter and what texts reveal support the status quo of power? And how can texts of all types assist in the ongoing pursuit of equity among free people?